WELCOME to the Takahashi-ha no Ryūkyū - Shuri-te Karate-do Website. The Takahashi-ha no Ryūkyū - Shuri-te Karate-do Kokusai Renmei is an organization entrusted with passing on and preserving the martial art of the late Takahashi Kentsu. We are dedicated to the preservation of our art and the cultural traditions and heritage we have been entrusted with for the next generation of traditional deshi (students). If you are genuine about learning a traditional Okinawan Martial Art, we then invite you to join our traditional legacy. Our family art is based on integrity, respect and honour, we believe that positive results are achieved through trust, mutual understanding and enthusiasm. The Oceania Honbu dojo is beautifully located in the scenic township of Mount Beauty; The Mount Beauty School Of Traditional Martial Arts, which is situated in the Victorian Alpine Region of Australia. Indeed the traditional budo teachings and philosophies shared; are a gift from our traditional Ryukyukan ancestry. Our traditional martial art was established and introduced into Australia by; Garry O'Connor Hanshi in 1980, after he received authorisation from his teachers; O'Sensei Takahashi Kentsu - Soke; of the Okinawa Ryu Karate do Shuri Te Seibukan Kokusai Renmei - Japan, and O'Sensei Suzuki Masafumi; of the original Seibukan in Japan. 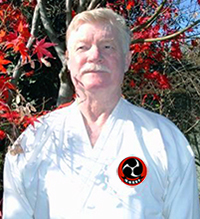 The principal sensei for the Honbu Dojo, and head examiner for Oceania, Hanshi Garry O'Connor, has trained in traditional budo continuously for the past 52 years, giving 40 years to teaching others. He has been acknowledged as the senior deshi (student) of; O'Sensei Takahashi Soke - 10th Dan (1900 -1994) Japan, and Ichirou Ito - Shihan Hachidan - 8th Dan (1947 - 2006 ) Japan. The Takahashi-ha no Ryūkyū - Shuri-te Karate-do was established by O'sensei Takahashi Kentsu Soke, Japan 1900 - 1994; who set in place the teachings and philosophies of our traditional art, establishing strong ethical principals which are the foundation of our time honoured Ryu. We welcome new members who wish to study and discover the traditional principals and skills within our art; we will not discriminate against any individual or organisation that may join us. The harmony of our philosophy was born from the characters of honesty, integrity, kindness and compassion; and we welcome everyone who will accept these guiding principles and adhere to these time honoured teachings. Our aim; is the preservation of our art and the cultural traditions and heritage we have been entrusted with; by demonstrating sincere devotion and humility to our study; therefore all students are asked to display sincere respect towards the art which they study; their Sensei's; fellow students and Dojo guests. Indeed this is our "Mission Statement." © Takahashi-ha no Ryūkyū - Shuri-te Karate-do 2018.